Product #21079 | SKU LSD64GCRBNA2000R | 0.0 (no ratings yet) Thanks for your rating! Capture high-quality images and record Full HD, 3D, and even 4K video with the 64GB Professional 2000x UHS-II SDXC Memory Card with SD UHS-II Reader from Lexar . This memory card features UHS Speed Class 3 (U3) compatibility ensuring a minimum data write speed of 30 MB/s along with a maximum read speed of up to 300 MB/s (2000x). These enhanced data transfer speeds are accompanied by a 64GB storage capacity allowing you to store a large number of pictures, videos, movies, and more. The Lexar SDXC memory card also comes with an SD UHS-II adapter allowing you to utilise the memory cards UHS-II compatibility when transferring files via the included adapter. In the event that you accidentally erase photo or video files or the card becomes corrupted, Lexar offers downloadable Image Rescue Software to assist in file recovery. 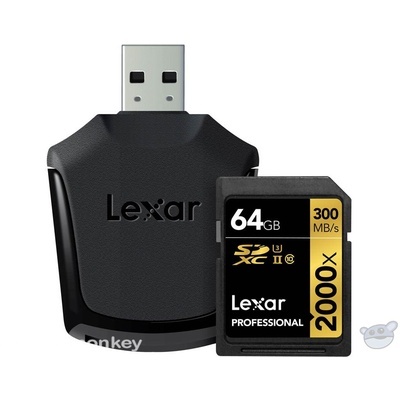 Whether you're a professional photographer, videographer, or enthusiast, this Lexar Professional 2000x SDXC UHS-II card provides performance you can trust. These high-speed cards leverage UHS-II technology (UHS Speed Class 3 (U3)) and provide a read transfer speed up to 2000x (300 MB/s) when used with the included SD UHS-II reader. For versatility, the cards also work with UHS-I devices at UHS-I speeds, and they're backwards compatible with older cameras and readers, performing at Class 10 speeds when used with non-UHS devices. This Lexar Professional 2000x SDXC UHS-II card comes with an SD UHS-II reader for high-speed transfer of files. Using a DSLR, HD camcorder, or 3D camera, you'll be able to leverage the latest photo and video features available for shooting high-quality images and enhanced 1080p full-HD, 3D, and 4K video. This Professional 2000x SDXC UHS-II card includes the latest version of Image Rescue software. Image Rescue recovers most photos and select video files, even if they'Voe been erased or the card has been corrupted. The software is available for free download with purchase of the card.